Bayabas – Scientific name: Psidium guajava L.
Bayabas is a fruit found throughout the Philippines. While the larger varieties are cultivated, most of it grows wild. It is very abundant on Mt. Banahaw in its wild form. The leaves and bark are known to be astringent, vulnerary, and antidiarrhetic. The bark is used in the chronic diarrhea of children. The fruit is known to be anthelmintic, and is used for high blood pressure, poor circulation, diabetes and asthma. The fruit also has probably the highest concentration of vitamin C of any of the tropical fruits in the Philippines. 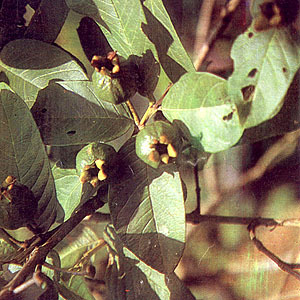 This entry was posted in List of Medicinal Plants in the Philippines and tagged bayabas, guava on March 8, 2009 by Pinoy Herbs. tnx so much…. wishu to have more info to share…. what is its leaf arrangement? what other interesting benefits of guava?